This image was passed from Dr Helen Kara to Dr Naomi Barnes, after I had challenged Helen with an image for the #blimage (blog+image) blogging challenge (see how messily interconnected that is?). You can read Helen’s post here and Naomi’s post here. You can see my first #blimage post, with an explanation of the challenge, here. Helen’s image spoke to me. It reminded me that one of my research participants used the metaphor of the spider’s web to describe the school as organisational web. 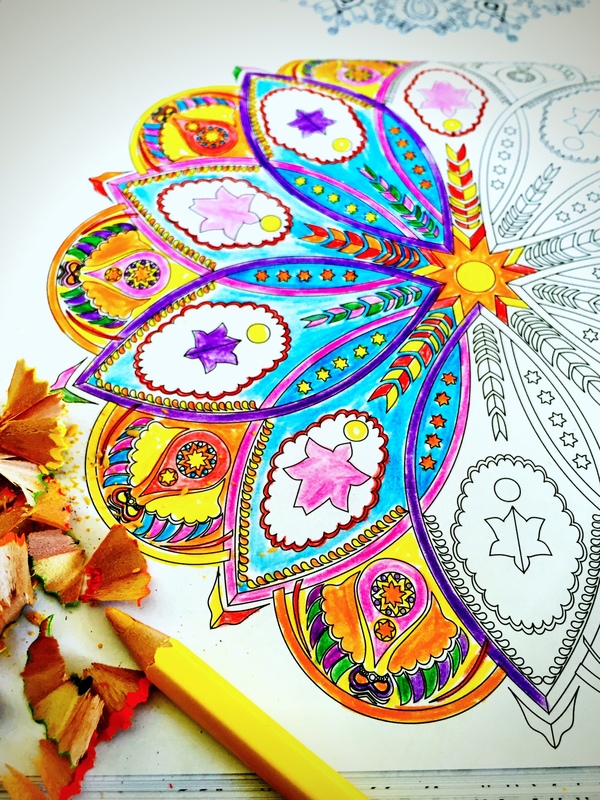 It is reminiscent of the symmetrical black and white webs in my mandala colouring book. Mostly, it speaks to me of connectedness in education, in our schools and classrooms, but especially through technology and social media. So the image forms the basis of this post about technology which connects. The labyrinthine tangle of webs are like snow-flake-like in their perfect imperfection. 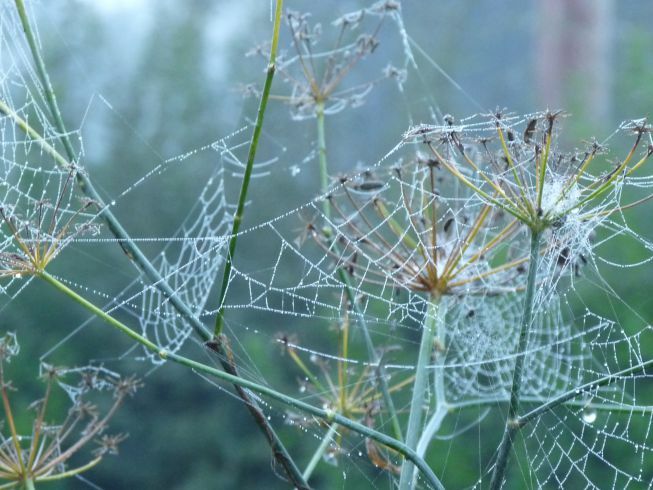 The wintery stems provide angular anchors for the fragile delicacy of the web strands which stretch and overlap. Some strands extend long distances, while others are strung tightly together. There is symmetry and asymmetry. Strength and vulnerability. Flexibility and rigidity. Beauty and disorder. A clamour and a stillness. These dewy webs evoke my experience of the professional connections I see and experience through technology and social media. My journey through various tools of connectivity as an educator has been one mirrored by others. Often I adapt before educators in my own school environment, but after those in the global spheres. As this blog approaches its first birthday, I am reflecting on how blogging has transformed my use of social media and my connections with others. Twitter has been a place of learning for me since 2009. As with most educators, I began lurking in the background, figuring out what might be in it for me, or consuming information. I moved on to curating others’ content, and then participating in education chats. That is where I stayed for a number of years, although the more chats with which I engaged, the more people with which I connected. The chats were a place for me to participate in conversations. In fact, my favourite part of being in a Twitter chat is when a small group goes off piste into their own tangential conversation. These are moments of connection and engagement, which are epitomic of Twitter’s rhizomatic chaos; its tangle of webs. In one Twitter chat Adriano di Prato and I came up with an accidental concept of ‘leaning environments’, showing the unexpected possibilities of connecting via social media. Last year, I began this blog as an experiment in blogging, and as a way to log and record my fellowship experiences in New York. My continued blogging has shifted the boundaries of my self and my connections. Not only does exploring my thoughts and ideas in 600-1000 word blog posts allow me to thrash out and clarify my thinking in more than 140 characters, it also opens up conversations with others who might want to engage with me or with the content of my posts. It is this opening of conversation which has expanded me and my network. My spider-web tendrils reach out and curl together with others’. Some connections are tentative while others are strong. Some traverse long distances while others are at arm’s length. As an individual, my blog feels like an extension of myself. Colouring outside the lines of my demarcated self, I share parts of my story, my thinking, my experiences, and my teaching, researching or writing practices. These tendrils of me reach out and entangle with the labyrinth of connection and conversation in the blogosphere. I respond, and am responded to. And so I become absorbed, in part, into the often unpretty cacophonous jumble of thoughts, hyperlinks and voices. More recently, thanks to the encouragement of Andrea Stringer, I have started using Voxer and I’m loving the immediacy and personal, conversational, collaborative nature of the medium. Right now, I’m involved in different professional learning groups and a doctoral researcher group. Valerie Lewis, who I’ve connected with on Voxer, in this blog post calls her Voxer PLN her ‘Vox Squad’, a kind of A-Team of professional learning and solidarity (‘I pity the fool who doesn’t Vox!’). I’ve introduced Voxer to my students as a collaborative tool for group work, and to my team of coaches as a tool for our collective growth and the ongoing refinement of our practice. To finish this reflection on connectivity, I’ll leave you with a very different web, as a contrast. Below is a picture I took in Richmond Park when I lived in London. 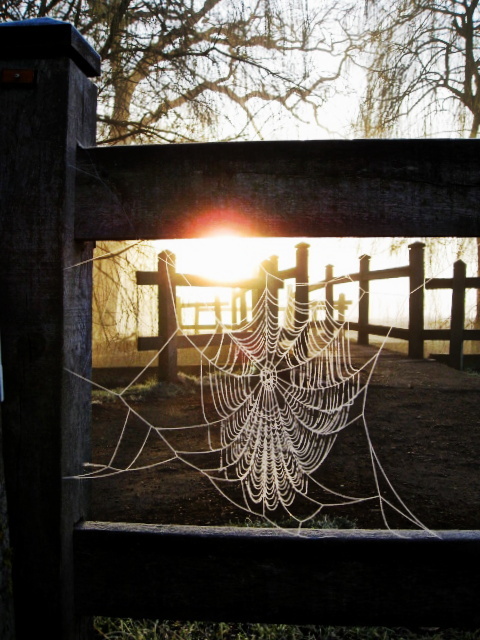 A solitary dew-jewelled web at sunrise. This image doesn’t speaks of connectedness in the same way that the first image of webs does. It shows a beautiful but lonely structure, tenuously clinging to the solidity of the fence posts. Which would you rather be? The solitary web or a web in a mess of other webs? A lone voice or one of a cacophony of voices? Are we better alone or together? Can our individual voices be heard in amongst the noise of social media? * Note: this is what happens when I am in the middle of tough PhD work. Lyrical, metaphorical musings and colouring-in become my creative antidote to the hard systematic work of thesis revision. This entry was posted in Education, Social Media and tagged #blimage, #edtech, blogging, connected educator, connected learning, learning technology, pln, twitter, Voxer by Dr Deborah M. Netolicky. Bookmark the permalink. 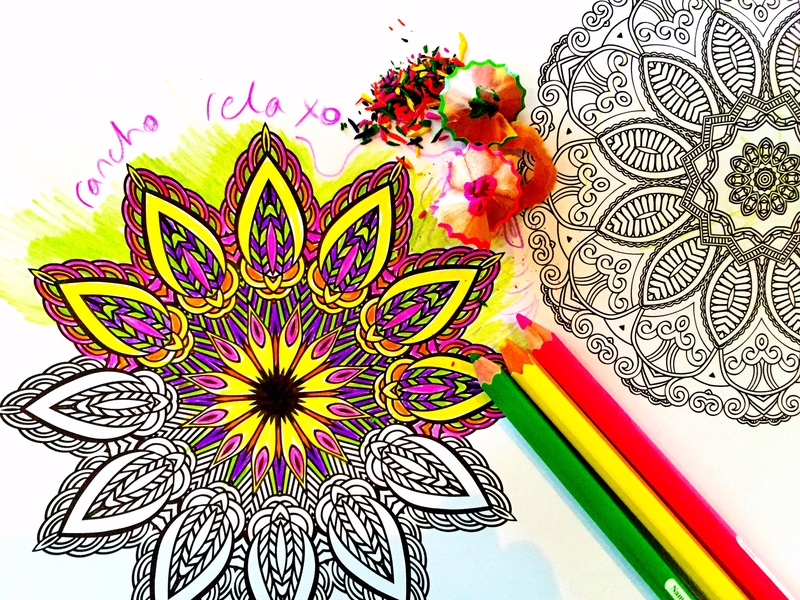 It’s funny the timing of this… My friend just recently introduced me to Mandala art (have not started coloring or drawing mine yet, but planning to!) and again because someone recently blogged his perspective on Twitter and I responded to him by saying, “the way you are describing Twitter is not the same as my experience with it” – it’s ok for some people to value twitter differently from us, but it does not dismiss our own deep experiences with it if we have them. Now I want to do more on Voxer. I have used it only a few times with a couple of peopple. What do you do on it? Back in my art school days I remember making mandalas in the Australian bush out of found natural materials. Very therapeutic! I’m finding colouring a good way to wind down when my brain is full of work and PhD. On Voxer I am in some groups which are focused around particular interests or problems of practice or projects. Some are about planning (a new Twitter chat), working through each others’ questions & being accountable for progress (my doctoral group), and talking about experiences & solutions (for school coaching models, for example). My students have started using it for group project work, and I have a team starting to use it for our growth as a group as we refine coaching practice & process. As the facilitator of that I’m leading discussion at the moment, but am hoping it will become more co-authored. I also have a couple of individual conversations going on. It sounds like a lot, but they don’t all move quickly so I’m not inundated.